Are you searching for a mythical creature? You know, the one with the single horn? Well, guess what! We've got a Yumio for that! Are we going a little fast here? Let's slow things down. Firstly, we're talking about unicorns. The legendary, mythical horse-like creature with the signature feature. A has a single horn pointed horn spiraling from its forehead! And as for the Yumio? Well, that's simply the newest costume craze. Part pajamas, part costume, they're completely, assuredly 100 percent fun! And now you can bring the mythical, magical unicorn to life. Simply by wearing this Pink Unicorn Yumio! As super cozy pj's, you can wear them to the costume party, but they're equally suited for lounging around the house in total comfort. But, whatever you do with 'em, you're going to be bringing the unicorn style. Yippee! 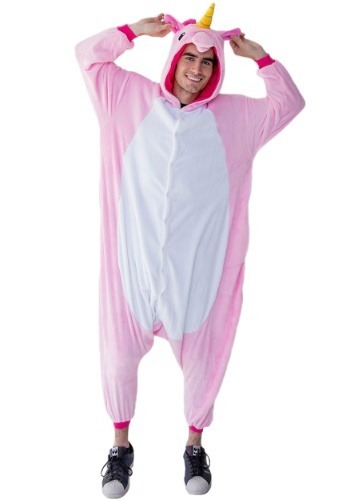 This is an Adult Pink Unicorn pajama onesie straight from I Love Yumio. It's 100 percent polyester, and has a super-soft plush feel. A button up front makes for easy on and off, and it features embroidered eyes, nose, and attached ears, mane, and horn on the hood for the perfect Unicorn details. This Yumio is sized to fit most people between five and six feet tall, up to 240 pounds. Keep this Yumio around and you'll always have an easy go-to look when an invitation to a costume party comes in. Plush, we're sure you'll love using these Yumio pajamas as pajamas—they're super cozy for wearing around the house. You might even want to wear this Yumio anywhere you think it'd be a good idea to have a unicorn show up. The mall, the pub, the concert, anywhere really!